RCS, publisher of the Italian daily newspaper, has received an offer from Cairo valuing it at almost 300 mln euros. That isn’t generous, and may not even offer a clean exit. But RCS has few options. At least this way its fate may be determined by a media group, not financiers. 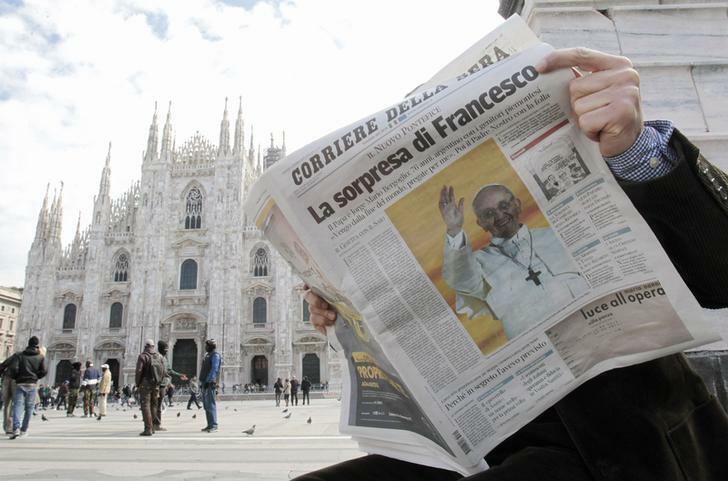 A man reads an Italian newspaper in Duomo square downtown Milan March 14, 2013. Shares in RCS MediaGroup, the owner of Italian newspaper Corriere della Sera, rose 28.8 percent on April 11 after Cairo Communication offered shares in exchange for a controlling stake in the company. Cairo said on April 8 it would offer 0.12 shares for every RCS share, implying a value of 293 million euros for the group’s equity, based on the target’s closing price that day. Cairo does not intend to delist RCS, but may consider doing so if it owns more than 90 percent of the stock after the offer. The offer is conditional on Cairo obtaining more than 50 percent of the shares, and banks agreeing not to call in their debt.